Anubis seems like a pretty chill god. He’s not a total blockhead like some of those Greek gods, who spent most of their time backstabbing each other. He mostly just likes to hang out with dead souls and guide them get to their proper place in the land of the dead. He also acts sort of like a bodyguard to the afterlife, since he uses his handy scale to weigh people’s hearts. (He makes sure all the jerks don’t make it in.) If you plan on choosing an Egyptian god to dress up as, then Anubis is your guy… or jackal. Now, you can be the Egyptian deity Anubis! 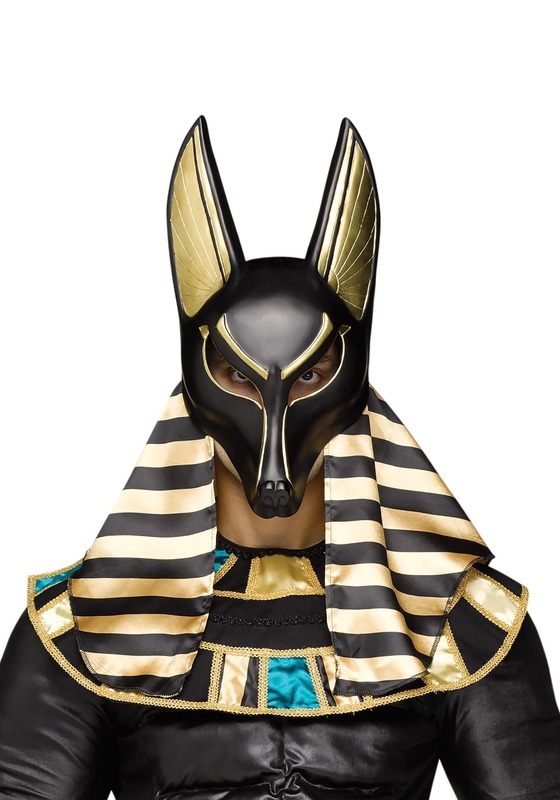 This adult Anubis mask is molded into the shape of a jackal face and has a black front with plenty of gold detailing on the ears. When you wear it, you can hang with the pharaohs or chill with the mummies, because everyone loves the ancient God of the Dead! Mask is awesome. Only thing wish it would come with that gold and black material but other than that the mask is easy to put on, rich color, and lightweight.